With part one of our Galaxy S7 review, it was clear that the Galaxy S7 was at least a mild improvement to the Galaxy S6 in some ways, but there were still many areas to investigate. 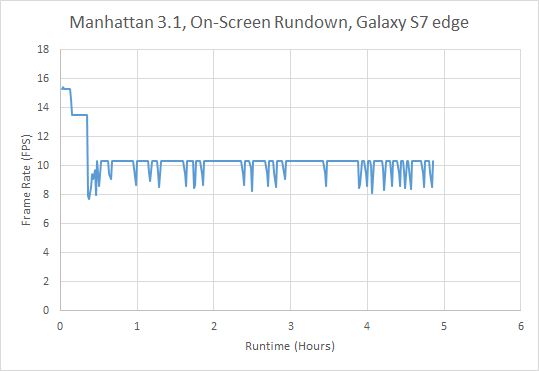 At the time, we were in the middle of transitioning to our new 2016 benchmark suite, which meant that it was necessary to re-test the Galaxy S7. Our 2016 benchmark suite attempts to really push our testing in general to a new level of depth and more importantly, more focused on the overall user experience. When reflecting upon the value of AnandTech from a testing perspective, it’s clear to me that while part of our value is running benchmarks across a wide range of phones, another part of our value is being able to run tests that others wouldn’t be able to run at all. With our new test suite for 2016, our extended suite of benchmarks attempts to focus on the latter to go deeper in reviews in a meaningful way. I definitely enjoy examining architectural details through microbenchmarks, but for general reviews our standard test workflow needed to be focused on user experience in a deeper way. With this in mind, we can get into the data that we were missing with part 1 of the review. Of course, if you haven’t read part 1 of the Galaxy S7 review, I highly recommend reading it first just to get a better introduction into the basics of the Galaxy S7. 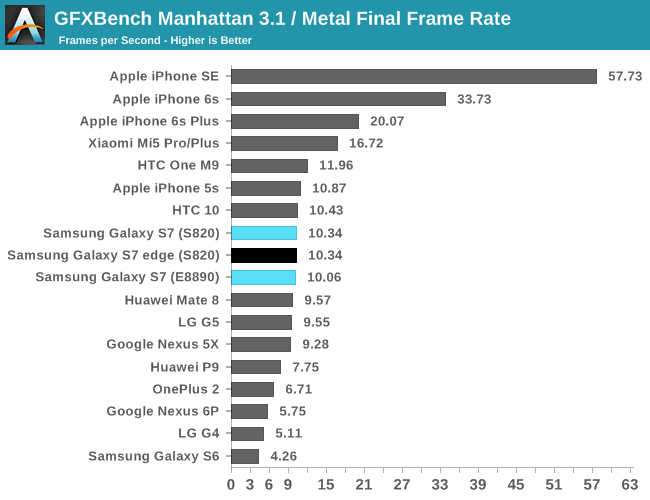 Of course, now that we have our full suite of benchmarks we can start to look over in detail how devices perform. 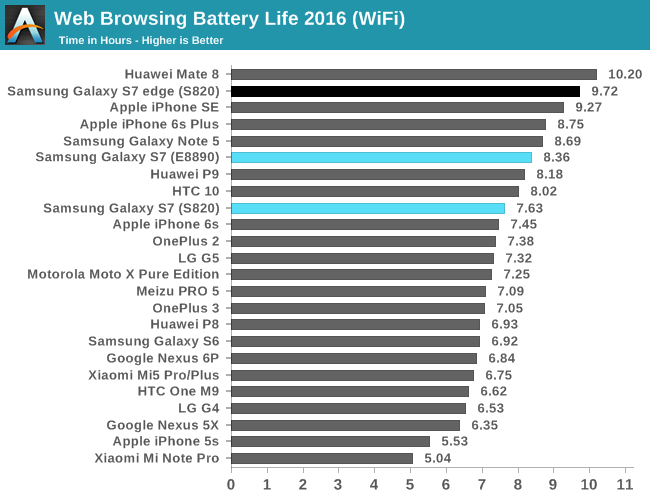 While we’ve gone over some of the results before it’s probably fair to say that our discussion of battery life on the Galaxy S7 was woefully incomplete with part 1 of the review. It’s also worth noting that internally we were still working on our 2016 web browsing test at the time so it wasn’t necessarily complete and sufficiently consistent and accurate. In the time since, we’ve been able to get all of the bugs ironed out and get a test that provides useful data that our previous tests didn’t. As battery life is a critical part of our testing, it’s important for us to get this right, and in order to get useful relative comparisons we have to make sure that every device is tested in the same manner to avoid bias in one way or another. In order to achieve this, all devices have all possible background services disabled, as well as sync and automatic app updates. In order to try and make an even comparison we also set the display to 200 nits brightness on a 100% average picture level display, also known as a blank white screen. However, one area that we aren’t necessarily able to control for 100% of the time is ambient temperature, device orientation, or material contact. While tests that don’t reach TDP limits won’t see any effects, TDP-limited tests will see a delta here, but it’s hard to estimate just how much of an impact exists here. With this baseline in mind we can move on to the actual results. As seen in the chart above for WiFi web browsing on our new test it’s worth mentioning that the data here has changed as changes to the test have affected results, generally bringing battery life down or keeping it around the same. The Galaxy S7 does fairly respectably here, although the Snapdragon 820 version is definitely showing either architectural or implementation inefficiency here when compared to the Exynos 8890. A delta of about 10% means that the Exynos 8890 GS7 uses about 1.38W average here while the Snapdragon 820 GS7 uses about 1.51W in this test assuming that the battery capacity is nominal. If you subtract out an estimated display power the delta that can be attributed to non-display factors is something like 30% here. Interestingly, the HTC 10 is mildly more efficient here with its higher density LCD, with the AMOLED display consuming something like 10% more power despite the presence of dark-themed webpages to try and bring some balance here. The Galaxy S7 edge is pretty much the top here, but achieves its battery life through sheer battery size rather than efficiency. 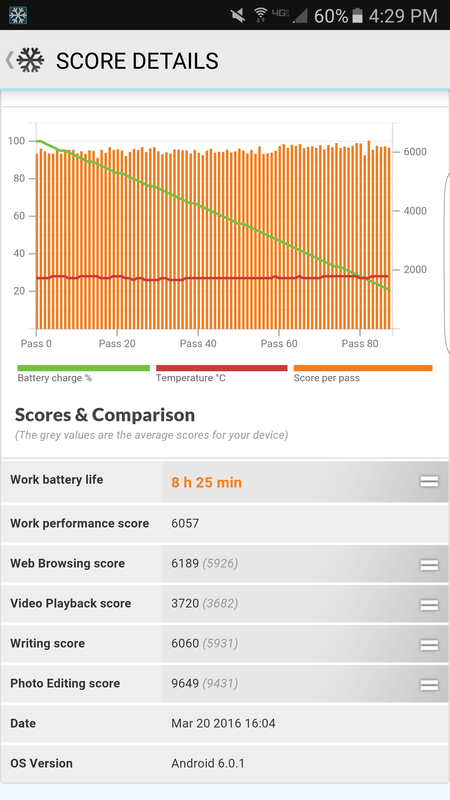 Moving on to LTE we can really start to see the battery life advantage that the Snapdragon 820 brings. It turns out that as a communications company, Qualcomm is good at making radios. One of the most obvious ways that this shows is in power, as the Snapdragon 820 basically has the same battery life whether you’re on LTE or WiFi, which isn’t necessarily the case with other devices. Unfortunately, we haven’t been able to test the Galaxy S7 with Exynos 8890 in comparable conditions for LTE so we can’t really see how power of the S820 modem compares with the Exynos’ Shannon modem, but we continue to see that the Galaxy S7 S820 is a bit behind the HTC 10 in battery life due to the use of an AMOLED display in high-APL workloads. However, the difference is nowhere near what it was in the past, and is close enough to not really make a huge difference. The Galaxy S7 edge performs well here, but on the basis of its battery size rather than efficiency. 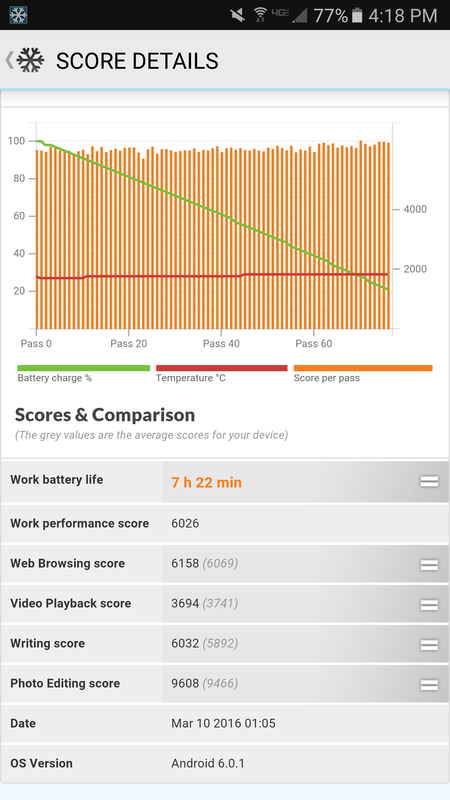 In the interest of not just relying on our own web browsing tests to try and get a handle for what battery life is like in general purpose compute situations, we continue to use PCMark’s battery life test to see how performance is in a benchmark that doesn’t attempt to equalize the amount of work done per unit time. Here the Galaxy S7 actually seems to be a fair bit better than the HTC 10, but this is likely due to the previously mentioned binning differences and some differences in governor as the delta in power and performance isn’t really all that much. 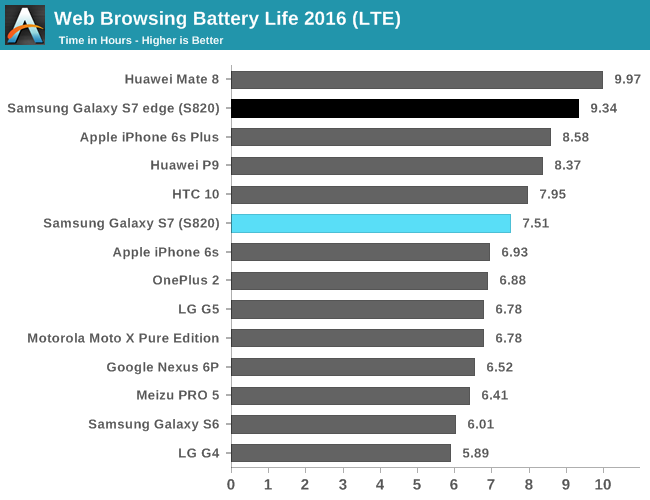 The Galaxy S7 edge extends the lead here, again mostly due to the larger battery as the two devices are generally quite similar to each other. Moving on to throttling performance we’ve transitioned to GFXBench’s Manhattan test on infinite rundown instead of T-Rex for this year as some devices from certain vendors have a tendency of reaching vsync on T-Rex which meant that it was difficult to see just how much throttling occurred over the duration of the test. After some testing it’s evident that for the most part throttling behavior is not necessarily changed by Manhattan either, so there’s not much need to retain T-Rex for high-TDP tests. 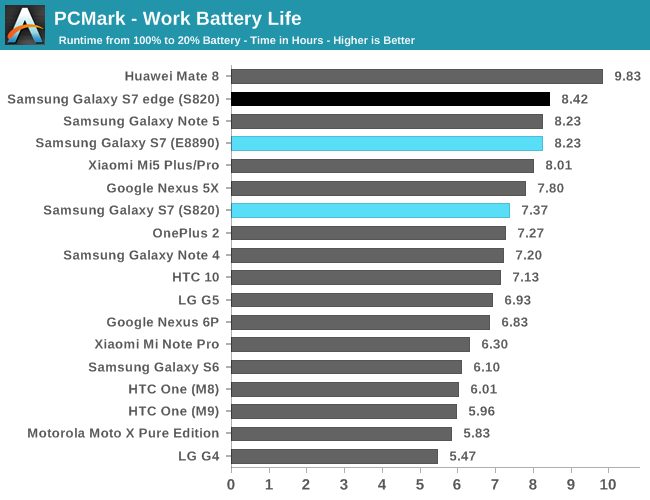 Basemark OS II’s battery life testing is also rather questionable at this point, so we will no longer be reporting these scores as the methodology isn’t up to par with our expectations for 2016 and beyond. 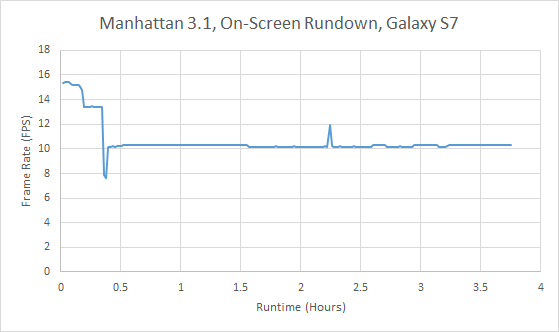 In the case of Manhattan, we continue to see some of the sinusoidal behavior seen in T-Rex throttling as it seems that Samsung’s throttling algorithms tend towards a more underdamped behavior than critically damped like HTC’s. However, for whatever reason it looks like the Galaxy S7 edge ends up with similar oscillating throttling behavior. Interestingly enough, even though the Galaxy S7 spends more time at higher performance states than the HTC 10, it manages to last longer, which is likely due to the lower APL of this content in conjunction with forced power save modes, and higher sustainable skin temperatures due to the glass back with heatpipe cooling to help distribute heat. Of course, the Galaxy S7 edge manages to last longer than either due to its larger size and battery. 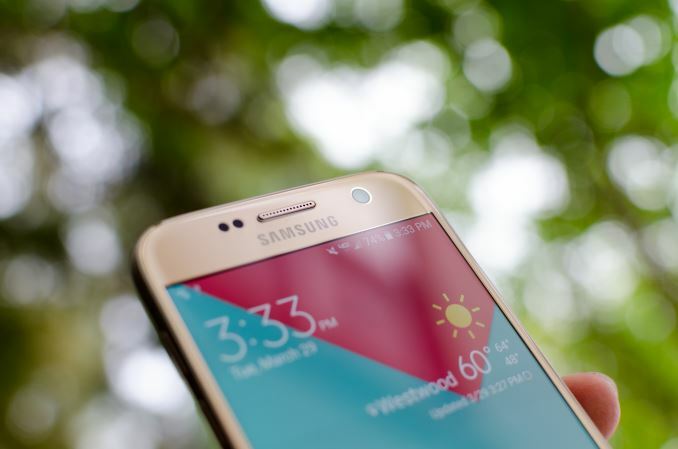 Overall, the Galaxy S7 has decent battery life, while the S7 edge has great battery life due to its relatively large battery compared to its display size. 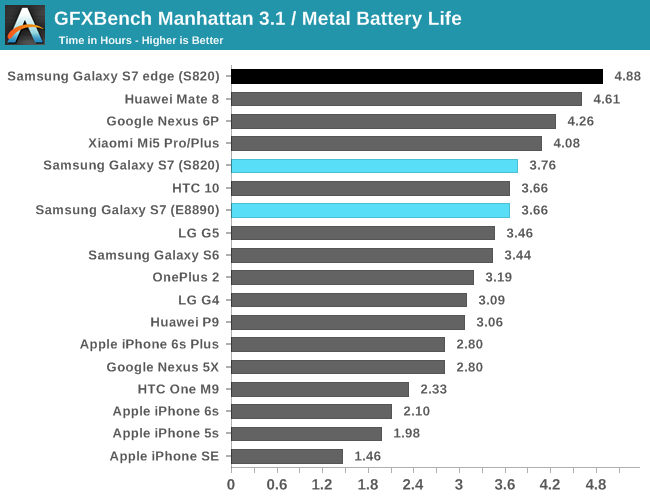 The improvements here aren’t necessarily going to blow you away unless you get the Exynos 8890 variant, but it’s good to see that we’re finally back to improving on battery life with the launch of the Snapdragon 820 compared to the Snapdragon 810 and 808’s rather disappointing power efficiency due to the use of a high-power implementation and process node. I’m not sure the Snapdragon 820 is really the best design we’ve seen on 14LPP when it's more on par with 14LPE SoCs for efficiency, but it’s good enough that it doesn’t fundamentally compromise a device. OK, now that I've read the whole review (and some parts twice), I can come to two conclusions. 1) The author is sort-of unhappy with Samsung's decision to dual source the SoC. 2) Lots of testing metrics (and data) don't match my personal experience with the phone (Edge, Exynos version), nor the hundreds of videos and reviews online. The only significant issue I have is with the front facing camera compared with other new hardware; it could be a LOT better (but I'm not a huge selfie person). The Exynos variant is significantly better than the SD variant this time around, probably because Samsung's software leans more to higher core count, but also because it takes advantage of the *better* co-processors on Samsung's silicon. The Exynos variant has better image/video post processing, better audio, better and more sustained performance, better RAM management and significantly better battery life compared to the SD variant. Too bad all the hype Qualcomm has been selling for the additional parts didn't live up. The Apple bias you get from this site is annoying at best. Everything in this review is laced with a undertone of how iPhone is just as good or better. Camera on the S7 is actually pretty danged amazing and easily better than what iPhone has right now. Other sites and reviews have posted their figures and results and they all show it but for some reason here the camera is just ok? Battery life on the S7 is actually quite amazing and noticeably better than past Galaxy iterations. The design is well executed and I did not see any mention of the water resistant feature which is a nice inclusion most other manufacturers dont even have. While Anandtech is getting better at moving away from esoteric benchmarks to show "in the lab" performance...these reviews were not holistic. How can you write a review comparing the iPhone 6s to the Galaxy S7 and NOT mention water resistance? I hope you don't live by that belief, DERSS. most mainboards has a protective coating, including the one in your PC. Mostly for dust and humidity protection. The ports, camera, sensors and most other things on the iPhone aren't water resistant. So... You might get lucky to survive getting it wet, but it most likely won't work properly after it.